The EPL-24-2L-LV-SOL-60C Explosion Proof Solar Power LED light fixture from Larson Electronics is the ideal lighting solution for remote areas and standalone applications where connection to external power is either impractical or unavailable. This powerful yet compact hazardous location light delivers crisp, clean light while reducing operating costs. Charged by the 30 watt solar panel, two 12V AC 8aH sealed lead acid batteries provide constant, reliable power to the 2 tube, 28 watt fixture. The EPL-24-2L-LV-SOL-60C ships with a convenient 60’ of 12/2 SOOW cord connecting the solar panel to the light fixture which allows operators to position the panel where the most ambient light is available. Light Features: This 2 foot long, 2 LED tube, explosion proof solar light fixture is ideal for use in remote locations requiring powerful yet compact hazardous location lighting. The EPL-24-2L-LV-SOL-60C features our second generation LED T-series 14 watt T17 style lamps which produce 15% more illumination at 8 feet as compared to standard T8 lamps when measured with an Extech light meter. Our LED-T series bulbs are visibly brighter than standard T8s and have consistently surprised many of our customers with their unexpectedly high light output levels. We have eliminated the ballast box normally associated with fluorescent fixtures which reduces overall weight, creates a slimmer unit profile, and helps this LED fixture maintain a T-6 temperature rating. The solid state design of the LED lamps gives this fixture superior resistance to damage from vibrations and extremes in temperature as well as a lamp service life over twice that of standard T8 bulbs. Charged by the 30 watt solar panel, two 12V AC 8aH sealed lead acid batteries provide constant, reliable power to the 2 tube, 28 watt fixture. These batteries are contained within the solar panel, not the light. The EPL-24-2L-LV-SOL-60C ships with a convenient 60’ of 12/2 SOOW cord connecting the solar panel to the light fixture which allows operators to position the panel where the most ambient light is available. The solar panel is equipped with either a day/night sensor and motion sensor or with an on/off switch. The day/night and motion sensor is programmed to active the solar panel in the evening and to shut it off during the day while the motion sensor will activate the panel upon detecting motion. The on/off switch will activate and shut off the solar panel according to the operator`s preference. Operators can switch between modes with a toggle switch. The EPL-24-2L-LV-SOL-60C provides 10 hours of continuous runtime when the battery is fully charged. Charging time for the battery bank is 5 hours when exposed to direct sunlight. As with all solar powered equipment, charging time is affected by the amount of available ambient light. Indirect sunlight and low ambient light levels, such as on cloudy days, will extend the charge time. NOTE: Larson Electronics has further upgraded the options available with this light. We expect the light to be mounted separately from the panel. This means the solar panel can be mounted in direct sunlight (not in the hazardous area) while the light is mounted in a hazardous area workspace. Standard installation for explosion proof lighting, including threaded rigid pipe to the LED light fixture and appropriate seal-offs, etc. are required. Additional Mounting Options: Unless otherwise specified, our standard, most popular configuration is the bracket end mounting shown above. 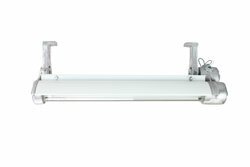 We also offer a pendant mount for those needing to suspend the fixture away from the ceiling surface (i.e. suspend from pipe or conduit). 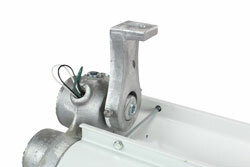 Standard Bracket Mounts: Each bracket is cinched to the bracket mounting peg on each side of the light. The angle of the bracket is set by tightening two cap screws on either side of the bracket. The cap screws act as a set screw. The bracket itself is mounted via a single bolt hole at the top of the bracket. There are two brackets, one on each end of the light. Once the brackets are mounted to a surface (ceiling, floor or wall), the light fixture can be removed from the brackets by loosening the cap screws that hold the bracket to the mounting peg. The pictures shown above illustrate the side brackets. The third picture enlarged below also shows the brackets at the both ends of the light. Power/Wiring: This EPL-24-2L-LV-SOL-60C is powered by two 12V AC 8aH sealed lead acid batteries that are recharged by a 30 watt solar panel. These rechargeable batteries provide a continuous supply of steady, reliable power. The lead acid battery pack is contained within the solar panel, not the light. 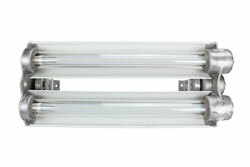 This fixture ships with 60 feet of 12/2 SOOW cord that connects the light fixture to the solar panel. Custom lengths are available upon request. Please contact us for special requirements. 6. A wrench is used to unscrew the end caps for relamping the fixture, while some competitive models require the end tap and knock off method to loosen the end cap. High mast lighting systems can be equipped with different types of lamps, depending on the preferences and requirements of the project or work site. Previously, high-intensity discharge (HID) luminaries were the standard used by companies that needed elevated illumination over a wide target area.